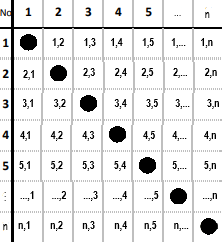 All combinations represented in the table (1,2 ; 1,3 ; 1,4 ; etc.) are stored as strings in an array with a total of (n^2-n)/2 elements (combinations). I'm looking for an algorithm that sorts the elements so no number of a combination is next to a combination with the same number in it. Of course this algorithm would only work with n > 4. Think of this like a chess board. Visit all of the white squares first (in a left-to-right, top-to-bottom scan). Then visit all of the black squares (in a similar order). Not the answer you're looking for? Browse other questions tagged algorithms sorting arrays or ask your own question. What are efficient ways to compute the derivatives of iterated functions?